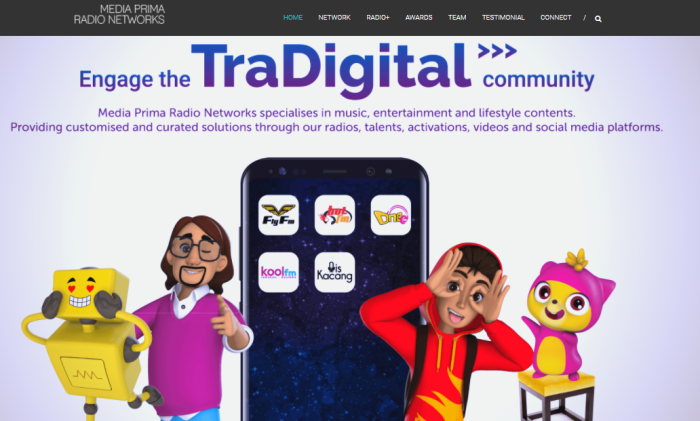 Media Prima Radio Networks (MPRN) has recently launched its new trade website which consolidates all of its offerings into one easily accessible point of contact. The new trade website is an initiative by MPRN which aims to provide easier access for clients in gathering information with regards to business collaborations with MPRN. This website has dedicated sections which consist of rate cards for its four stations, as well as the profile of MPRN’s podcast hub, Ais Kacang. One of the main highlights on the website is the section for Radio+; an initiative to further enhance MPRN value via three key pillars, namely Radio Plus Talent, Radio Plus Digital, and Radio Plus Activation. Besides above, the website allows its clients to engage MPRN’s TraDigital community for product trial with MPRN on-ground team that engages almost 3,000 people every week. The website also includes testimonial videos of partners whom have had its campaigns executed by MPRN – ranging from SMEs to big corporations, information about the team and the awards won by MPRN. Hays has released its 'Salary guide 2018' for five markets, including Hong Kong and China. Digital has seen the most growth over t..